Bipolar Disorder: I am One who has an altered mind. For about a month, I’ve driven to Des Moines on Sundays to attend the Unitarian Church there. I love the facility—an eco-friendly building nestled in the woods with a wooden footbridge from the parking lot that crosses a burbling stream. Every week, I’ve met interesting, like-minded people with amazing stories to tell. The messages are uplifting, and I get to sing. I feel very welcome and comfortable there. 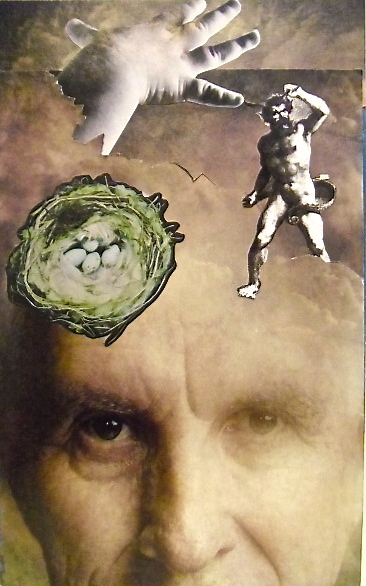 SoulCollage® is a creative process in which we make our own deck of collaged cards for the purpose of self exploration and self acceptance. Images are intuitively selected and cards are created in a manner that accesses your deeper self and facilitates a journey to wholeness. 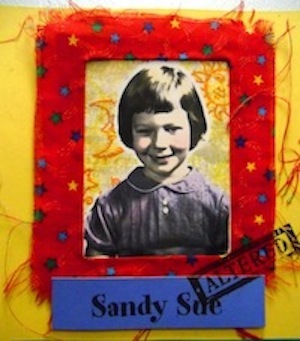 Created by Seena Frost, SoulCollage® allows you to create a deck that is the “Story of You.” This is a fun, intuitive process that requires no artistic experience but allows every one to becomes their own artist. The four-week class will include information about SoulCollage®, making of the cards, and working with the cards to understand their meaning. I couldn’t imagine a class more tailor-made for me! I had to go. I loved it from the moment I walked into the room. Native American drum music in the background, chairs set in a circle, simple instructions. Don’t think. Pick three images that either attract or repulse you. There were hundreds of images culled from magazines and who-knew-where-else laid out on tables. We silently walked around, looking at them all, then took the ones that called to us. I consciously kept my brain from rushing ahead to what it might mean, what I would collage with it, blahblahblah. The point was to follow our intuition. The Captive: I am One who is blind to the assistance in front of me. The way we introduced ourselves to the class was to pick one of the images and speak from it, starting with “I am One who…” This image would be the base for our first card, a part of our selves that made its presence known. Since I was a little manic at the time, I immersed myself in the process, sent away for the book and supplies (dang cheap, I may add), and started making cards at home. I’ve been collecting images my whole life with no idea what to do with them except keep them safe. 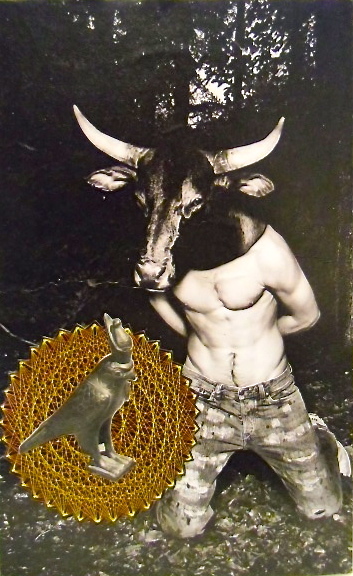 A lot of the images I use in my collage and mixed-media art, but many are too weird or personal to be appropriate for pieces meant to appeal to others. 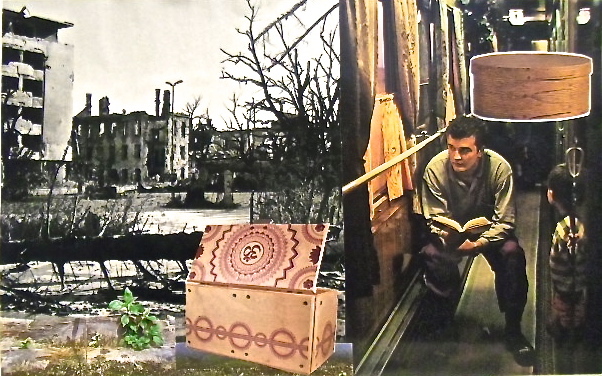 So, I pulled out my huge stash of images to see if any of them spoke to me the SoulCollage® way. The clouds parted. Angels sang. This process is a little like making your own personal Tarot deck. There are Suits as in Tarot, but these Suits are a bit different. The Committee Suit are cards that depict parts of one’s personality, while the Community Suit picture actual people, places, pets, significant events in one’s life. The Companion Suit is comprised of animal guides connected to the seven chakras, and the Council Suit collects the archetypal energies (much like the Major Arcana in Tarot). This is Play that could last a lifetime. Our class didn’t meet this week due to the Thanksgiving holiday, but our facilitator invited us to a card-making gathering she was having at her office on Friday (Not surprisingly, Maureen is a psychotherapist specializing in PTSD). I went, bringing some of my images and using some of hers. I love the silence of doing the work, then the community aspect when we speak from the cards and process what they mean for us. I fully intend to participate in any workshops Maureen holds, especially the one on The Companion Suit. It seems like a little guidance and meditation might be in order to “find” these special animal guides. The Observer: I am One who sees Reality without judgement. I love turning off my brain and just letting the cards form. I never know what’s going to happen or what images will demand to be put together. It’s alchemy. And deep Play. And manic or not, I love it. Because it’s an adventure, and I’m all about that. I’m giggling over here, because I wasn’t sure if I should post about this. Ahh, that intuition! AND these cards are compelling! Sandy, you sound so happy and that you have found a place that gives you what you need and I have a feeling that they will gain as much from you. I am happy for you. This is really interesting — I like the intentionality of it. I think I do something similar with words / quotations, in collecting stuff that says something to me, but I really love the idea of laying the stuff together and seeing how it intersects. Come to think of it, when I was a hyperreligious teenager we did stuff like that with Bible versese but this has a different feel to it. I also collect words, but this is very different. In fact, the cards intentionally don’t have words so that the images shift and change meaning. well, words also shift and change meaning. For those of us who think visually almost never, like me, images could be a hard sell — but I could totally see doing this with words, in fact, I am going to try it over the break. Let me know what happens! will probably blog about it if it turns out to be useful! Cool! I pinned your wonderful SoulCollage®s. You’ll laugh when I tell you this… I’ve known you how long? Forever, right? Yes, forever. And it just dawned on me that I make collages just like you. I just don’t make cards (art)… but I still do and feel what you describe here. I put my collages up in front of myself, wherever I Am. As I sit here writing to you, I can look up at the windows in front of me in my office, which are splattered with words and pictures and things… Inspirations all. And my bathroom mirror is my favorite landscape. I have always made collages, but until you described it this way I never put it together. That is strange… but true. So thanks for sharing. This reaches out a bit further than just tapping into the animal totems that present themselves to me… or the inspiration I find while walking in the woodlands or hiking to the river. Fore several years I have collected items, taken photographs, putting them together in my home as little treasures of my walk with Nature. I never realized that in a broader sense, this is a connective collection of what inspires me… and ties me to the wildness within my soul. These treasures and finds that adorn my walls and shelves are truly a soul collage. I never thought of it that way! Jeepers, Sandy! What a revelation – thank you! Cool! I think a lot of us collect bits and bobs without really knowing why. I like how this process pulls it all together. That sounds tailor-made for you. How great that you found this class and that instructor! I agree, Peg. I’m trying to say “yes” more often, and it’s paying off. Heather, thanks so much for reading and putting your voice here! I did see that the CD was available, and read the meditation in the book. I’m hoping out class facilitator will offer some sessions for the companions. I think she’s planning a workshop on archetypes in January, so I won’t miss that. So nice to meet another card-maker!